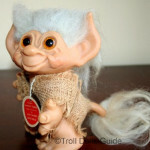 Russ Berrie and Company trolls are known simply to collectors as Russ trolls. According to company history, Russ Berrie made trolls for many years but they became popular in the 1990′s. That is when the company started producing many many Russ trolls. As I understand it, Russ is no longer making trolls. There was a lawsuit settlement with the Dam Company. You can still buy Russ trolls from Amazon sellers and Ebay. Russ trolls are plentiful at garage sales. I believe that the largest Russ troll made was 27 inches tall. Small trolls include pencil toppers. If you are interested in collecting Russ trolls, there are many bargains to be found! Unfortunately if you are selling Russ trolls, the prices that you will receive are not very high. That said, there are some Russ trolls that are be sold for a decent price.